* (0:28) The video that explains the intro. * (1:13) Pitching campaign ideas as a practice exercise, and then grading the pitches. * (12:17) Pat’s non-pitch, which turns into further deconstruction of Chris’ approach. * (0:37) Be sure to get your postcards in for our contest! * (0:53) Chris gives a shout-out for a rather unusual gift. * (4:45) What we each feel is missing in our current gaming groups or would like to see in a new player. * (0:28) Introducing yet another Adam. * (2:45) The postcards contest is still awaiting your entry! 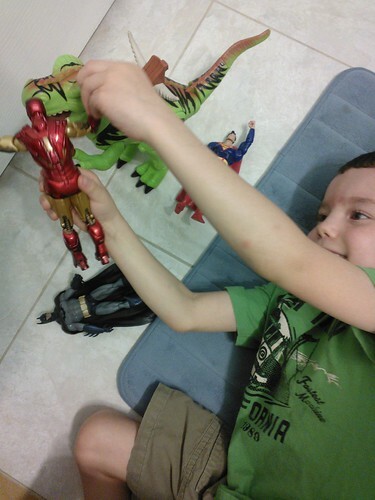 * (4:57) Batman, Superman, Iron Man, a dinosaur, and Toy War 2. You can see the fight that started it all here.